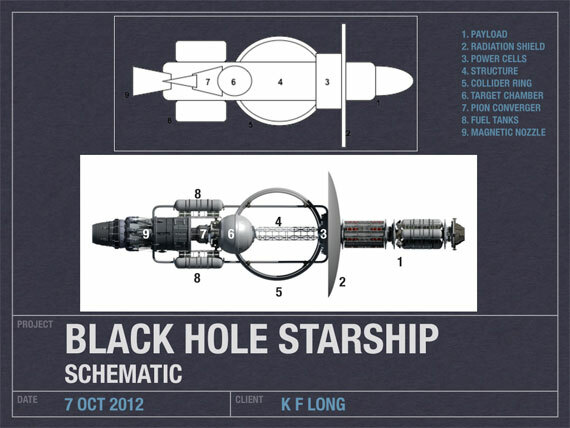 A black hole starship is a theoretical idea for enabling interstellar travel by propelling a starship by using a black hole as the energy source. The concept was first discussed in science fiction, notably in the book Imperial Earth by Arthur C. Clarke, and in the work of Charles Sheffield, in which energy extracted from a Kerr-Newman black hole is described as powering the rocket engines in the story “Killing Vector” (1978). In a more detailed analysis, a proposal to create an artificial black hole and using a parabolic reflector to reflect its Hawking radiation was discussed in 2009 by Louis Crane and Shawn Westmoreland. Their conclusion was that it was on the edge of possibility, but that quantum gravity effects that are presently unknown will either make it easier, or make it impossible. Interstellar flight certainly ranks among the most daunting challenges ever postulated by human civilization. The distances to even the closest stars are so stupendous that constructing even a scale model of interstellar distance is impractical. For instance, if on such a model the separation of the Earth and sun is 1 inch (2.5 centimeters), the nearest star to our solar system (Proxima Centauri) would be 4.3 miles (6.9 kilometers) away! The fastest object ever built by the human species is the Voyager 1 space probe, moving at a speed of 18 miles per second. If it were heading toward Proxima Centauri (which it’s not), Voyager 1 would reach our nearest stellar neighbor in about 80,000 years. Clearly, if interstellar travel is to be accomplished on human timescales, much greater speeds are required. At 10 percent of the speed of light (a thousand times faster than Voyager 1, but a conceivable speed for likely soon-to-be-realized fusion engines), Proxima Centuri could be reached in approximately 45 years — less than a human lifetime. However, the necessary energies to achieve substantial fractions of the speed of light, thus cutting the travel time to the stars to less than a human lifetime, are equally mind-boggling. Every pound of starship moving at 99.9 percent the speed of light will have a kinetic energy more than three times greater than the energy of the largest nuclear weapon ever detonated. Nevertheless, there may be a way of supplying an engine with such prodigious energies. In his 1955 paper Geons, John Wheeler, one of the pioneers of the theory of black holes, coined the term “Kugelblitz” — which translates literally to “ball lightning.” He suggested that if enough pure energy could be focused into a region of space, that energy would form a microscopic black hole, which could be described by the equations of Karl Schwarzschild — a “Schwarzschild Kugelblitz” (or SK). Fast forward 19 years to the ground-breaking work of Stephen Hawking, who realized that quantum mechanical effects near a black hole’s event horizon (the boundary beyond which no light or other radiation can escape) would give rise to the emission of radiation, so-called “Hawking Radiation.” The smaller the black hole, the greater its radiated power and the less its mass, but the shorter its lifetime until it completely evaporates. Wheeler’s postulate and Hawking’s theory of black hole radiation make conceivable an entirely new type of interstellar spacecraft, one whose propulsion and/or power systems would be fed by a Schwarzschild Kugelblitz. To be useful, a SK would need to be small enough to expel the required energy, light enough to be reasonably accelerated, but large enough to have a sufficiently useful lifetime. Such a Schwarzschild Kugelblitz would be incredibly small, smaller than even a proton, which is one of the basic constituents of an atom. Despite being so miniscule, Schwarzschild Kugelblitzes are incredibly heavy. A typical SK weighs more than two Empire State Buildings, and has a power output of approximately 129 petawatts (1 petawatt = 10 quadrillion watts). This is 10 million times the July 2013 power consumption record of New York City! In 1960, physicist Freeman Dyson postulated that an exceptionally advanced civilization could surround a star with a spherical shell with a radius of 1 Astronomical Unit (the average distance between the Earth and the sun). This would allow them to harness the practically inexhaustible supply of radiant energy. Such a Dyson Shell will almost certainly remain technologically impossible for our civilization for the foreseeable future, however. Alternatively, a tiny Dyson Cap (a small section of a Dyson Shell with a radius far less than 1 AU) is much more conceivable. The Dyson Cap could be positioned beyond the bow of the starship so that it would absorb the radiated energy of the Schwarzschild Kugelblitz. This would provide forward thrust for the starship. However, the numbers do not render this option favorable. 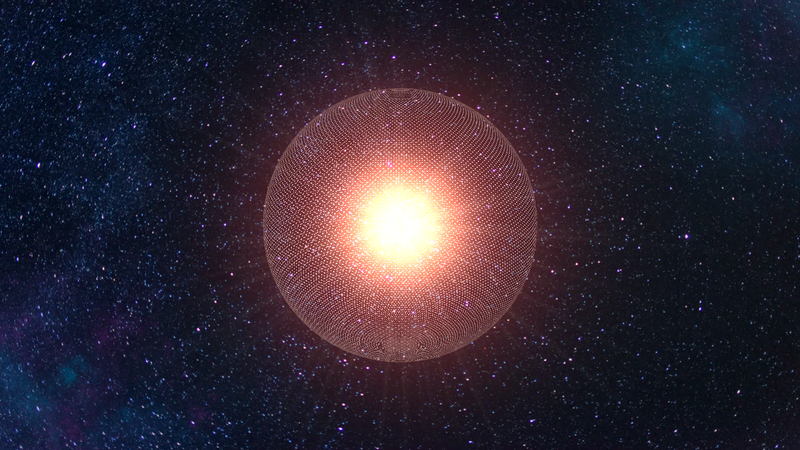 Dyson swarm – a large number of independent constructs orbiting in a dense formation around the star. Consider a Dyson Cap constructed from, for instance, titanium. The absorbed energy from a SK’s gamma rays would melt such a Dyson Cap out to distances of approximately 19 miles (31 km). However, at a distance of say 20 miles (32 km), the radiation from the SK could be captured by the Dyson Cap without the risk of it melting. The thickness and diameter of the Dyson Cap would need to be optimized for maximum acceleration. A large diameter and large thickness would increase the amount of absorbed radiation. However, there is a tradeoff here. Too much material, the cap becomes inordinately heavy, and the starship’s acceleration is reduced. Too little material, and insufficient radiation is absorbed to produce appreciable acceleration. The need to place the cap so far away from the Schwarzschild Kugelblitz means that the Dyson Cap will receive very little radiation, and consequently provide very little thrust. In fact, over the course of the approximately five-year lifetime of the above-mentioned SK, a starship the size of a 100-storey office building would increase its speed by only 4 parts in 100,000 above its initial speed; it would have accelerated a distance of only 1.5 AU! Even if the mass of the entire structure could be reduced by a thousand-fold, the starship would reach only 4 percent of the speed of light at the time that the SK evaporated. In contrast, postulated fusion reactors show promise of offering 2-3 times this maximum speed! Alternatively, if all of the accessible energy could be captured and if a significant fraction of it could be used for propulsion, the outcome changes substantially. One approach to accomplishing total energy capture is to surround the Schwarzschild Kugelblitz with a tiny Dyson Shell. The absorbed particle energy is fed to a heat engine, which propels the starship. When all of the available energy from a typical SK is fed into a 100-percent efficient engine, the starship will reach 72 percent of light speed in the five-year lifetime of the SK. This formidable subluminal speed would allow a starship to reach, within a human lifetime, a number of stars in the solar neighborhood. To construct a Dyson Shell (or Cap), an exceptionally light and very absorptive material would be necessary, because a 20-mile-radius (32 km), 0.4-inch-thick (1 cm) titanium Dyson Shell would have a mass of more than 1,200 Empire State buildings! Alternatively, a Dyson Cap that absorbs radiation that would be fed into a heat engine would have a lower mass, but would also deliver an inferior acceleration. Furthermore, a gamma-ray laser is currently the only conceivable technology that could be used to make a Schwarzschild Kugelblitz. However, such a laser’s output frequency would need to exceed current technology by more than a billion times. Its pulse duration would have to be a hundred billion times shorter than that of lasers today. The total energy of a single laser pulse would need to be equivalent to the energy the sun puts out in 1/10 of a second. While it’s true that the technical challenges render it unlikely that a SK will be fueling an interstellar starship anytime soon, it’s imperative that we embrace a wide range of theoretical research. SKs can produce many petawatts of useable radiation; therefore, they hold the potential to be an ideal source of power for interstellar starships. Thus, in time, Schwarzschild Kugelblitzes may merit a position of distinction on the vast technology arc that could one day take us to the stars. This entry was posted in Interplanetary flight and tagged Black, cap, Dyson, hole, INTERPLANETARY, Powering, Starship. Bookmark the permalink.